We hope you had a great camping season! Now it's time to prepare your RV for the coming winter months. So here's our "Winter RV Checklist" to help you "winterize" your RV. 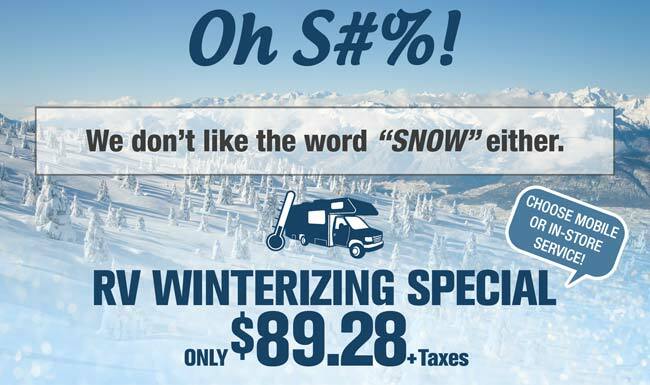 Winterizing your RV for only $89.28 +tax. Price is for in shop or on site. Mobile Service call for winterizing will be an additional $35 within our service area. Washer/dryers, and ice makers extra. The first step is to make an appointment to bring your RV in for service. Call our Service Dept Toll Free at 1.800.668.1447 or complete the form below, and one of our service advisors will contact you to confirm the appointment date and time. This is a guide only and is not meant to replace your owner’s manual. Please refer to your owner’s manual or an RV technician for additional advice. For motorized units please refer to the chassis owner’s manual. We have put together a video on how to winterize your RV if you decide to do it yourself. Wash the RV exterior including the roof. Use an RV wash and soft bristled scrub brush. Any mold or mildew that has started will continue to grow until the unit is washed in the spring. Don’t forget to clean the frame and undercarriage as well as the wheel wells, tires, and steps. Make sure the awning is washed but do not roll back up until the awning has time to dry completely. Lubricate any moving parts such as door hinges, entry door handle, lock and deadbolt, baggage door locks, slide out gears and stabilizer jacks. Protect your slide out seals and other rubber seals with a rubber seal treatment. Clean and vacuum the inside of the RV. Remove all perishables. Chemicals in deodorant, shampoo and conditioner, skin lotions, and toothpaste may freeze and the container could split, they also could attract rodents and insects. Make sure to remove all food and food particles from the kitchen and eating areas. Crumbs stuck in cushions and crevices will also attract unwanted guests. Remove toilet paper, Kleenex, paper towels and rags that could be used to help animals make nests. Defrost clean and dry the refrigerator/freezer, place baking soda inside the fridge and freezer compartments and leave the doors propped open. Remove any valuables from inside the unit and in the storage compartments. The thieves may not appreciate this but your wallet and insurance company will. RV’s are a target for thieves all year but while many RV’s are not used over the winter months, it may be weeks after a theft has happened that it becomes discovered. Drain your black and grey water holding tanks at your nearest dump station. If needed flush out the black tank using a toilet wand. Have the plumbing system winterized: Drain the fresh water tank. Drain your water heater. Bypass your water heater using the valves already installed or by installing a temporary bypass. Install a suction line on the inlet side of your water pump and put that line into a jug of non-toxic antifreeze. Turn on the water pump and run the anti-freeze through all the plumbing lines both hot and cold. Don’t forget the outside shower, shower hose, toilet, ice maker, and washer/dryer as equipped. Pour ½ cup of antifreeze in all P-traps. Inspect the underside of the RV for holes and gaps that could allow mice or other intruders into the unit. Remember that a mouse can fit through a hole the diameter of a pencil. Where necessary install expanding foam sealant, caulking, wire mesh, or other means of filling the holes. If the unit is plugged in make sure that the power cord hatch is sealed as it is an easy entrance for many animals. Install mouse traps in the unit. There are also other products that can be used to help prevent intrusions, there is a spray on material that coats the underside of the RV called “Mouse Free”, there are electronic devices that produce a high frequency, these items require 110v power, as well as others. All of these items will help protect your property from damage. Now is the time to reseal the RV as any cracking, failed or missing caulking could allow water to enter the unit which may not be noticed until the spring, requiring extensive repairs at that time. Check all roof seams, vents, antennas, etc. for cracking and voids in the sealant, reseal as needed with a self-leveling roof sealant. Check all windows, compartments, moldings, doors, and hatches and reseal as needed. When storing an RV for long term, it is a good idea to remove and store the batteries at the same time. A discharged battery will freeze at a very quick rate and if frozen the battery will likely need replacing. Clean the top of the battery and the terminals using a backing soda and water paste, check the water level in the battery and top up as needed, fill each cell to 1/8” below the bottom of the fill tube. You can now charge the battery before storing. Label the battery cables for easy hook up and remove the cables from the battery. Store the battery in a cool dry area but make sure they will not freeze. If covering your RV during storage, use a high quality RV cover that is breathable, do not use a tarp. Allowing the RV to breathe prevents moisture build up which can lead to mold, mildew, rust and corrosion. Cover your tires with a light coloured UV resistant cover to help extend their life. Don’t forget to check on the RV during storage. Refill moisture removers and empty as needed, check the mouse traps, check for exterior damage, broken vents, and inspect the trailer for water leaks. Check the tires to make sure they have not gone flat. Following these steps will help maintain your RV and make for an easy and enjoyable camping season.